It's a tale as old as time. Two lovers, separated by a plastic barrier, finally get to meet. They're not normally kittens and puppies, but whatever. 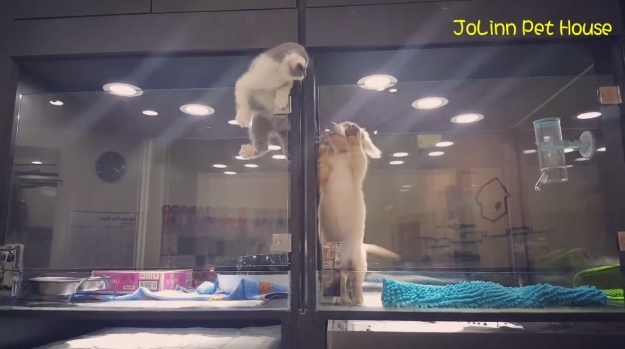 The JoLinn Pet House, a pet store in Taipei, Taiwan, posted a video of a kitten attempting to escape its pen by leaping over a gap in the top. A neighboring puppy is wildly excited at the prospect of the kitten coming over from next door. And typical in love, the puppy nearly knocks the kitten off the ledge. Rest assured, it has a happy ending. In a way, it's really just a spin on the balcony scene from Romeo and Juliet, except with adorable, fuzzy animals. NOTE: Thinking about getting a dog for your family? If you are like many, you may be considering buying a dog from a pet store or breeder. However, before you make a decision, consider the benefits of adopting a shelter dog. Though pet store or breeders' canines may seem the more advantageous choice, rescue dogs can be equally rewarding and perhaps an even better addition to your family. Responses to "Romeo and Juliet: Two lovers, separated by a plastic barrier, finally get to meet"
Puppy actually pulled the little thing right to him. How cute is that?